collage of images on my print table cover…yummy! I got into the pool the other day. So how is this earth shaking news? I used to swim all the time, at least three days a week for nearly 20 years. Then in 2014-16 I had this inexplicable weird thing going on in my replaced right knee, where it would fill with blood, rendering me immobile and in great pain for days, and weeks on end. I actually noted that it happened 40 times in 52 weeks in 2015, which left me useless most of the year. I had several come to Jesus moments where I understood the message I was receiving was about surrendering control. I also became even more familiar with living with chronic pain, a subject I was certain I had previously mastered. So what interrupted my swimming was when I got into the pool one day in 2015 and my trick knee froze, leaving me immobilized in the water. It took an act of Congress to get me out of the water, and fear of re-ocurrence prohibited me from entering the water again for nearly two years. About three weeks ago on a lazy Sunday afternoon I walked through the fear. I drove to the pool, told the guy at the desk that I was re-entering the water after a long absence and could he keep an eye on me?! Sure he said mumbling something about old ladies. I gingerly lowered myself into the pool and after a few terrifying moments actually enjoyed it and stayed in for at least thirty minutes. The miracle was my body did not hurt the entire rest of that day. That was worth noting as my body always hurts. It is just what happens when you mess with Mother Nature. Parts hurt. Always. Three weeks passed and I rationalized from one day to the next why I could not possibly go swimming that day. Finally on Thursday I went again. And again I had to walk through the fear to get into the water. It was immediately warm and comforting. As I moved through the water I was aware of my hurting parts. I was really aware of my knees until I decided this is probably how knee prostheses feel in the water. It had been so long I had truly forgotten. As I began to relax through backstroke (oh my shoulder!) and breaststroke (why did I leave my goggles at home?) and stretching and bending, something else happened. I began to forget all the scary reasons why I put off this lovely form of exercise! I began to think about how swimming should be mandatory for every citizen. You must get into the water and float for at least 25 minutes every day! Think of how unstressed our population would be if everyone just got into the water and moved around. Why is it so hard to do this? How long will I allow this old fear to hold me hostage? I don’t have the answer to it except to say that my new goal is at least once a week to get back into the water, as I still get my cardio in other ways. I imagine at some point the fear will just fade away, maybe even glom onto someone else who needs it more than I do. Apparently this aqua movement not only shifted the pain, but also my brain. I finally got started on #20! How to design it has left me frozen in inactivity since before I went to OH for the Quilt National opening. I had typed the story and so this morning I made the screen and painted the background cloth, plus several remnants that will also be used for lettering. I am still not 100% sure where it is leading me, but I work well with that kind of direction. I had a little problem with the paint leaving blobs on the cloth but immediately saw it not as crisis but as design element with which I can work. One of the things I most enjoy about this series work is I am continually challenged by how to convey my message or tell the story. The piece I have been working on (#16) these past weeks is about our marriage. A couple months ago I began the prep work by dismantling my wedding dress, which my mother had sewn from heavy cotton pique, lined with cotton flannel. This dress was so well constructed & sturdy, I could have gotten married in the Arctic in January, instead off spring in the Bay Area. After I took the dress apart, I made Thermofax screens of our vows from a fill-in-the-blank book gifted by the preacher. I printed not only the dress fabric but some of the flannel as well. Additionally, I had retained one bridesmaid dress which was also made by my mother. The wedding theme was based on my Russian heritage. The bridesmaids and I wore headscarves and their dresses were of a flimsy, but lined, cotton voile in a red/white/blue paisley print. The dresses were ‘granny’ style with a wide ruffle at the bottom. Initially I thought to incorporate the ruffle into the new piece but nothing about that spoke to me. I decided instead to fuse different size squares onto the now pieced wedding dress background. That gave the entire piece a bit of a whimsical feel which certainly was not my intention, but worked! I hand-stitched a piece of the dress lace vertically to the piece. Then I basted my great grandmother’s hand crocheted lace headscarf to the base and hand-stitched that down. Only in doing so did I find a few areas of disintegration that previously were invisible to the eye. My idea was to then layer and hand-stitch my headscarf on top; but something was missing. It didn’t quite feel right as the headscarf was a large triangle bound in trim and essentially blank in the middle. So I decided to hand-stitch the image of hubs and I walking down the aisle onto the headscarf before I stitched it to the base. That became my challenge. I didn’t want to trace it and potentially ruin the one and only priceless heirloom. I thought of several options but none seemed right, so I asked an artist friend and a mentor for their opinions. And voila, from that came the solution. I printed the image onto silk organza which I pinned onto the back of the headscarf heirloom. Then I gingerly placed it into a hoop and stitched the image through to the headscarf. Only after I lost the light when the sun went down did I realize I could perfectly see the image from the reverse side, so I flipped it over and stitched from the reverse, remembering to knot accordingly. Ah success. In today’s morning light I cut away the printed organza on the back side and voila! I have exactly what I wanted. 2nd layer showing part of GGM’s headscarf and bridesmaid fabric on top of screen printed dress…stay tuned! 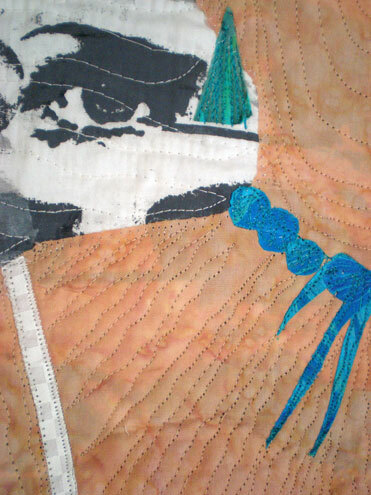 Although I have known for some time this week I received confirmation that my Tall Girl Series: A Body of Work will have a special exhibit at the 2013 Pacific International Quilt Festival in Santa Clara, CA. October 17-20. This will be the second time my exhibit has been featured in one of the Mancuso shows, the first being in 2011 in Denver. It received much press and praise there so I expect that will continue. Whenever the ‘tallgirl’ as I have come to refer to the project emerges it brings a sense of time warp with it. Since I finished the project and moved on, and have dealt with much of the debilitation by having both knees replaced and had the dreaded two MRIs my ‘tallgirl’ experience has greatly expanded. Had I not done the work I would not have been emotionally and spiritually equipped to handle the challenges that followed. And yet every time I am brought back into that time my heart heals just a wee bit more. So the exposure is a good thing. Also I am published again! This week I received the beautiful new Fabric Surface Design book by Cheryl Rezendes. My work is featured on page 305 as one of a series of artist profiles: those who use paint, wax, resist, image transfer, prints etc to create color on cloth. I started to read it last night and I am already so inspired! The beautiful illustrations and detailed technique explanations make me anxious to get back to making beautiful cloth again. It is always an honor to have my work featured in the books of others. Right now I am torn between starting my big Earth Stories project, doing an altered book as homage to my parents or doing another landscape piece. So many choices! total knee replacements in the past year and a half, the loss of my aged father and my husband’s health issues my muse has hit the road. I have been able though to do creative bits and pieces here and there but the big work just stares back from the wall. The smaller tasks do not necessarily fill my creative well but get things done. Most recently I made a baby quilt for my cousin and his wife who are expecting a bambino next month. I always take these on with great fervor and then quickly remember how much I hate sewing a straight line! For me it is practically impossible even with the positioning foot on the machine. About halfway through I give up control on whether the recipient will like it or not. It is my process after all not theirs. When my daughter was born we received 3 hand-made baby quilts and we still treasure each one three decades later! One by grandmother, another by great-grandmother and the third made by a friend. All treasure. I also bought a new computer which I sorely needed and have been challenging myself nearly daily to figure out where my images are. Some are on an external drive, some on the new operating system. Some I can’t read the title line so I have to open them up to see. After spending countless hours trying to ferret out an image for someone I decided it was easier to take the work downstairs and just reshoot it. Over 3200 images I have at this point…a nightmare! The new computer also brought me a real-time full-view of my website and I hated the dark edges of the header artwork, so some tweaks were made to that. Meanwhile I cleaned up some of the images (those I could find!) and so now it is looking spiffy once again. In between I am painting four new pairs of ‘chucks,’ delivering work to a gallery exhibit in Oakland, preparing work and signage for my solo exhibit the month of April in Sausalito, and taking a mixed media class from a mentor. I am close to thinking about the start of 3 pieces for Earth Stories which are due this fall. I pretty much have it designed in my head. I just need to physically do the work. And hubby and I have been watching episodes of Doc Martin as a little British humor cures all! In July as I was headed into surgery for my 2nd knee replacement I booked a trip to Phoenix for New Years. My theory was the trip would serve as a goal and it did. Up until three weeks before departure I was still pondering if I was strong en ough yet to travel. Finally I decided there would always be a FIRST trip so why not now? So we went, I did fine physically and learned I was much stronger and had better stamina than I had thought. First lesson. We took a Road Scholar program which we have done many times before. After 40+ years of marriage we have talked about just about everything and several things many times over. Road Scholar gives us the chance to explore an area, meet interesting people and talk about something other than the economy, the kid, and the dog! Primarily I chose this program because the activity level was rated EASY. It turned out not to be EASY at all as it required a lot of walking but I did learn that EASY actually means ‘must have a pulse.’ There were many in our huge group who barely qualified and of those nearly every one was a complainer. Never in my life have I heard so much whining! A small group of us younger seniors stuck together for stimulation and survival. Lessons learned: avoid the EASY programs. Also maintaining optimism as we grow is crucial to aging well. Despite the whining there were wonderful parts to the program. A visit to the desert botanical gardens included two incredible art exhibits amongst the plants. The Four Seasons b y Philip Haas featured 15′ tall sculptures of fruit, vegetables and plant foliage. Awesome! Also the innovative sculptures of Carolina Escobar wrapped around and through cactus and other plants throughout the gard ens. The Phoenix Symphony on NY Eve was such an incredible treat. I was so inspired that I bought tickets for our regional symphony next week. I have been thinking about going to the symphony for a really long time. I have no idea what stopped me before because the right time is now! We also sat through two lectures on the anatomy and function of the violin and the trumpet. It was everything I could do to stay awake and having sacrificed the Rose Parade to learn about trumpeting made it all the more painful. Less on learned: I don’t really care how that horn was made just blow it already! This program like the one last spring in Texas we learned about storytelling. We all have a story. We should all be telling it! Unforgettable! We toured the Phoenix Art Museum and the beautiful Heard Museum and again I learned I am a visual learner. I just want to see it with my eyes. I don’t care much to read about it. Two more great experiences were to visit Frank Lloyd Wright’s Taliesin West…aka his home in Scottsdale. It was a textural and pattern junkie’s delight and I shot many images there. And the fabulous interior of the Arizona Biltmore Hotel with its collection of Navajo rugs…stunning! While I was very tempted to buy two gorgeous art pieces in Scottsdale I bought nothing but a FLW inspired fridge magnet! Between cleaning out my father’s things, having the urge to purge my own and starting a new life chapter I just did not want anything bad enough to bring it home. Lesson learned: I have enough. Possibly the best lesson of all: to experience life without having to possess it. It was good to have a change of scenery and great now to be home and in the studio once again. Long ago a very wise woman and fellow artist suggested keeping a work in progress any time there would be a studio interruption due to travel, illness, or whatever. I have done that ever since and it is brilliant as I can just pick up where I left off. So I am making progress, day by day, an hour at a time on my latest work. Seldom do I sketch a design. Yet on this piece I did a free-hand sketch inspired by some Googled images. Then I colored i n with pencils, enlarged the design, and traced it onto acetate. I slapped that on the overhead projector and drew the design on freezer paper. That was all in July before I had my 2nd knee replaced. It has been staring at me from the design wall ever since. Last fall when I had my first knee replaced I did the same thing. For that piece I screen-printed imagery on a woven cotton tablecloth with metallic threads. I had an idea in my head of what I wanted to design for an exhibit. The cloth and the design hung on the wall for at least 3 months until I was able to stand for short periods of time and design. What happened in that 3 months time is I changed my mind. In the end the design of Keeping Up Appearances #5 was nothing like my original idea and plan! And yet I loved how it turned out. So it has happened again. My original sketch and pattern lie beneath the piece actually being constructed. I am not ready to show it publicly just yet but clearly it has a mind of its own. And I honor that. After all who am I to tell fabric what it wants to be?! I really do like the idea of letting the cloth speak. After all that is what happens in my wet studio of surface design. I keep working the fabric until it sings. It’s been suggested to me a couple times that I may want to continue on with my Tall Girl Series: A Body of Work. The series was a healing project in which I found my voice and released a very old harrowing tale from my body and the imprisonment of my mind. It took me four years to complete the work and even when I was finished I was unsure if I was actually done! As I continue to live in the body that was surgically reworked I continue to come across other adaptations I might need to address as the story evolves. The most recent of these is the two knee replacements of the past 14 months. Although it didn’t seem like it at the time I skated through the rehabilitation process of my right knee in October 2011. Fast forward nine months and the left was replaced. I was overjoyed as I thought these final two surgeries would change my life forever; probably not unlike my parents’ hope for the original shortening surgeries. The nearly five months since the second knee replacement has been perhaps the most challenging time since the original mid-century tall girl surgeries. I just assumed I would be stronger and have increased mobility with no limitation. Instead I traded one set of issues for another due to life-long weakness. Recognizing that PT was going to take me only so far despite ongoing weakness I recently began working with a personal trainer. She is fantastic, patient and encouraging. Her background is in dance and she is teaching me how to function in my body. I don’t recall that I ever have learned function. I learned only coping mechanisms. I learned to walk any way I could so to get out of the house at age 18 when stuck in a wheelchair. I learned how to fall down and get up the easiest way. Easy is not always functional. So now I am learning these new ways to function with symmetry in this body. Talk about old dogs learning new tricks! Twenty years ago when my knees began to break down the concession I made with myself was that my body is broken and I would do whatever I could to maintain mobility given the limitations. It felt like a gift to honor myself so. Now I am reprogramming my brain to envision a fully functioning and properly aligned body. That which initially felt like a gift is now instead a HUGE burden, a heavy pack I have been carrying for most of the past two decades when the debilitation began. As a result of ‘completion’ of the tallgirl series I have accepted the choices made, the surgeries conceived and carried out, the long rehabilitation, the concessions of ‘good enough’ and the acceptance of my physical and mobility limitations. Now I believe the time has come to let go of all of that. It is a new chapter. The day after my first knee replacement when I was on morphine I had a dream of a jail cell being unlocked and the door left ajar. It was not lost on me even in a stupor how significant that image was. Today I really get it. What once comforted me in my disability now is stifling. I do believe there is a new chapter for the Tall Girl Series… on acquiring a new sense of self within this body. It may always be (surgically) broken but no longer has to cripple my mind.